In Play Therapy with older children, “tweens”, and teens, one of the important tenets is helping the child to establish a sense of self – Who am I? Who do I want to become? What are the innate things about me that are lovable and of value? Too often, girls especially are targeted at a young age through media and savvy marketing to believe that “I am not enough”, “my body is not good enough, skinny enough, pretty enough”. This crushes a young girl’s self-esteem and confidence, placing them in even a more vulnerable, emotionally charged way of existing. A powerful art-based play therapy technique is creating an Inside/Outside Box. This art-based play therapy intervention is focused on helping identify how a child sees themselves, as well as how they think other’s perceive them. In this activity, the making of a collage is used as a powerful, symbolic representation of the self. The child can choose (or can bring into session) a shoe box with a lid. Instruct the client to cut out different words, pictures from the magazines that represents how he/she believes how others view him/her. Glue them into a collage on the outside of the box and lid. Explore how other’s perceptions may or may not be true, what the client thinks about and feels while looking at their “outside box”. On the inside of the box, the child repeats the process using different magazine pictures and/or words. However, on the inside of the box is how they see his/her true self and identity. Ask the client to share what each symbol or word is, and what it’s symbolic meaning to them personally. Process any thoughts and feelings that may surface. How does it feel to look at the outside of your box in comparison to the inside of the box? What would you change about or add to the outside of your box, if anything? What would you change about or add to the inside of your box, if anything? Note, this may take several sessions to complete, you may also want to assign to do as “homework” for older children and teen clients. 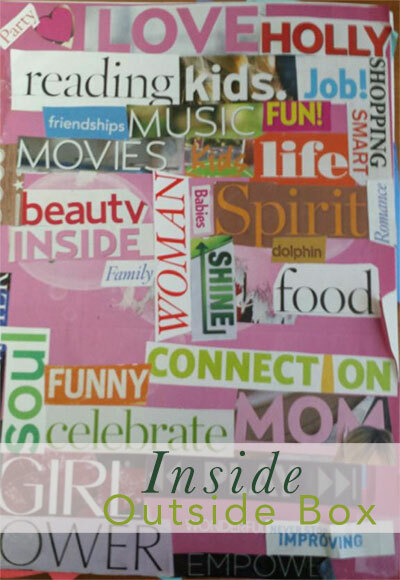 The Inside/Outside Box is a wonderful tool that elicits powerful emotions and helps the tween and/or teen begin to see their whole self- creating a launching pad for blossoming self-esteem and self-worth. Thanks, Clair, for this insightful project! Check out more from Clair here! To learn how to articulate an empathetic response. To understand what it means to help someone in a difficult situation. Prepare the shoe boxes in advance. Group leaders are only limited by their imagination. The nearby illustrations are some examples of what might go inside the shoe boxes and what text might accompany each box. If working one on one with a client, the counselor may choose to create a box with the client. Following the discussion participants literally put themselves in someone else’s shoes. One by one the shoe boxes are presented. Inside each box is a pair of shoes, along with some accessories to complete the look. Under the lid of each shoe box is a description of the person who wears those shoes, and a tragic life event that they were currently facing. Children are encouraged to “put themselves in that person’s shoes. Discussion should occur throughout the activity through the utilization of follow-up questions to each individual scenario. Each empathy based story should include questions such as “How do you think he/she feels?” “What could you do to help” “What is something you could say to him/her?” Encourage participants to use empathetic responses with correct terminology when discussion each shoe box. If time permits group leaders may also want to role play the sharing of empathy in situations proposed by the participants, or that were part of the discussion at the beginning of the activity. Participants can be prompted to say, “You must feel ______.” This is a great culminating activity that helps the participants cement what exactly we mean when we talk about empathy. Plus, it reinforces the experience and definition of empathy, making it more likely for the participants will be able to respond with empathy in the future. An important aspect of emotional competence is the ability to show empathy. Young people are often quick to judge one another and use vulnerabilities against peers, all while trying to keep their own vulnerabilities disguised. During this activity special emphasis should be placed on the varying ages of the mock scenarios. Participants should be led into a discussion focused on the fact that age equivalencies or discrepancies do not affect our potential to be empathetic to someone. Empathy can be shown to anyone, regardless of age. It is very helpful for participants to see that they are not the only ones with a given fear. It was also good for participants to take the time to think about how someone else would feel if they came in contact with their greatest fear. By acknowledging someone’s feelings participants are learning to let others know that they have been heard and understood. Helping others is also an important theme during this activity. Typically, the help we are in the position to offer, isn’t necessarily something that is materialistic. Offering help and friendship is the best way to provide that person with the support they need to overcome the situation. Thanks for this wonderful and thoughtful exercise from Brandon R. Menikheim! The Self-Esteem cards encourages young people to explore self-confidence, healthy growth and development, setting and achieving goals, and valuing self. The Ice-breaker Question cards have over 196 thoughtful conversation starters and prompts. These cards can be used with one other person or in a small group. It is also appropriate for families. The Divorce cards encourage children to talk about their parents divorce, their feelings, and identify strategies for coping. Playing the Totika game helps children relax as they discuss this difficult subject. The Teen-Adult Principles, Values and Beliefs cards consist of over 150 thought-provoking questions about personal principles, values and beliefs. The open-ended questions are designed to promote moral development, social awareness and civility. Questions in this card deck are more challenging and not appropriate for players under 13. The Jr. Principles, Values, and Beliefs cards are similar, but written for younger children, ages eight and up. The set includes open-ended questions designed to promote moral development, social awareness and civility. This deck is intended for use with children but may be used with adult players too. The Life Skills card deck includes open-ended questions intended to promote healthy relationships, social skills, coping strategies, critical thinking and sound decision making abilities. Totika is suitable for 2 or more players, ages 8 to adult. Get the Totika game with all six sets of cards from Childtherapytoys.com today! Here’s a great intervention idea from reader Martha Nodar aimed at empowering young girls and helping them express themselves. Ms. Nodar earned a gift certificate to childtherapytoys.com for her submission. Learn how you can do the same! Disney’s film “Frozen” is not only a heartwarming fairy tale of two sisters, but also a visualization of the impact that loss may have in one’s life. An early bond between two young sisters, Elsa and Anna, is severely interrupted by the misunderstanding of two parents who did not know what else to do to protect their younger daughter from their oldest daughter’s extraordinary powers. Rather than negotiating a middle ground, the parents, led by their fears, opted for an all-or-nothing strategy and isolated the siblings from each other. Bettelheim (1976) argues that fairy tales are a safe vehicle through which children may learn how to cope with their environment. He champions the symbolic form as a tool in attempting to resolve early wounds. Siblings who may have been separated from each other as the result of divorce or family hardship may identify with the sisters’ separation. Anna grows up deeply wounded by the separation from her sister. Anna and Elsa are robbed of their childhood, including having the ability to play with each other. Each experienced the loss of their sister and also their playmate. Viorst (1986) suggests that losses are necessary for growth. Audiences witness Anna’s growth and determination to reach out to her sister. Another theme that may be found in “Frozen” is the notion of frozen emotions and frozen defense responses in a futile attempt to survive a loss. For instance, Elsa chooses isolation and avoidance—unhealthy responses, most likely learned from her parents who decided that isolating Elsa from Anna was the best way to keep them safe. “Frozen” is about family dynamics which may be explored in the sand. Disney has given us not only the opportunity to celebrate sisterhood in the biological sense, but also to highlight a theme not commonly observed in Hollywood or in real life—two females helping each other. Instead of the expected rivalry, the end of the film takes us by surprise when we learn that Anna’s true love is the love she feels for her sister rather than romantic love. An alliance between Anna and Elsa is pivotal for creating the relationship they both long for and for thriving in a much healthier environment. Anna and Elsa bridged their differences and created a better world for themselves and for others around them. “Frozen” is about what we do (nurture) with what we inherit (nature). Bettelheim, B. (1976). The Uses of Enchantment. New York, NY: Knopf. Viorst, J. (1986). Necessary Losses. New York, NY: Simon & Schuster.